Tea and Tea ceremony have close relationship with Zen philosophy. There're some tea rooms in temple complexes, Kita-Kamakura. Get relaxed and take traditional Japanese green tea there. You'll have the essence of the tea, too. Related blog: "Kita-Kamakura, a hub of Zen philosophy", "Meet and shop unique Buddhism statures in Kita Kamakura"
In Butsunichian tea room of Engakuji complex, you can enjoy authentic Matcha tea only. In Nyoiann An-nei tea room of Engakuji complex as well, you can enjoy authentic Matcha tea, Japanese seasonal confectionary or Matcha ice cream, viewing the traditional garden. Open days:　Wed, Thu and Fri. On 2nd Sat, open 15:00-16:00 only. Notes: Closed during August 2018. 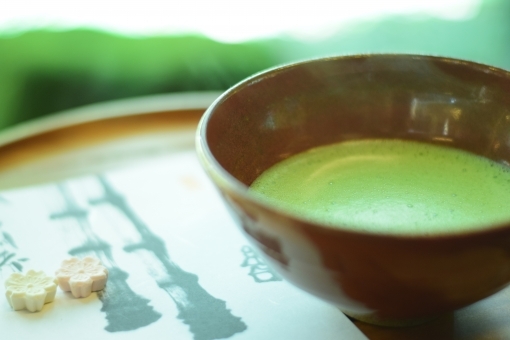 In Gesshouken tea room of Meigetsuin, you'll enjoy authentic Matcha tea and coffee. In Komaki nearby Kita-Kamakura station, you'll have Japense seasonal confectionary and Matcha tea. Enjoy tea time with Japanese Matcha.